I have a 88 % translatet script for SO and no solution how i can insert this in the english rom! At the moment i try to find the hole script in the translate rom of DeJap. As reference i try to use the dump of the Head Topic her in the forum. It has a impact on the doalog text when i change any letters. Has anyone the full table of SO and could give me this file?! I heart Bes has got a tool from Darfforce for Star Ocean. I have already write Bes a PM, but he show ne reaction. Is he at the moment in the holidays or inactive?! Has anyone other the tool and could it offer for the german translatioN? Can anyone said which compression is used in SO? DTE? Bes is inactive but come sometimes. I don't know which compression is used in SO US but I think it's not DTE. Bes has read my pm today, but no anwer at the moment. SO use Huffmann + Dictonary compression for the text. 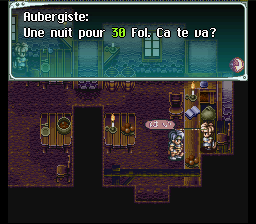 What is the status of Star Ocean in the french translation? Will they finish anytime? Who is working on the translation and is active in the scene? Is there a tool which i can use to decode huffman compression? Redscorpion a écrit : Who is working on the translation and is active in the scene? Redscorpion a écrit : Is there a tool which i can use to decode huffman compression? Il y a ça mais est-ce que ce serait utilisable/adaptable pour "Star Ocean", mystère. Unfortunatly it is not designt for the SO rom. I try several things, but the tool terminate the windows process. work in this scene, without help or support. 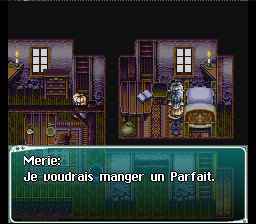 The French translation is completely stuck since DarkForce's disappearance, somewhere in 2003. The script is translated, but without insertion tools, we can't do anything more. And I don't think that Bes can help you. As BahaBulle said, he is now retired. My information which i get was that darcforce has gave the SO tool for inseration. 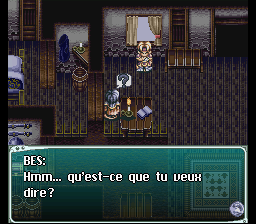 How could Bes or the team around Star Ocean french translation make this screenshot, when they have no tool or any information about the compression? Er... DarkForce was the only hacker of the French project. He gave us the script, we translated it, then we resent him. Bes has never been involved in SO hacking. DarkForce produced a beta French patch (... crippled of bugs) a long time ago, so we were able to take some decent in-game screenshots. No more, no less. Damn. Thanks for your answers ! This is soooo bad for the german and french translation! 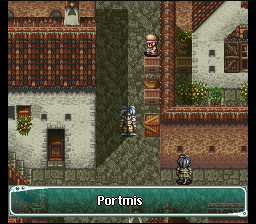 Hi, I am the German translator of the game Star Ocean. 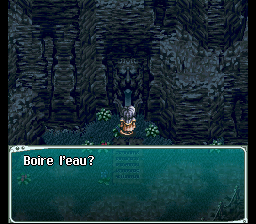 In our comunity has a member "blackerking" the Tilt's found the letters in English and in Japanese, now it should be possible to insert umlauts "ü, ö, ä, ß"
Salut, je suis le traducteur allemand du jeu Star Ocean. Dans notre communauté a un membre "blackerking" l'Tilt trouvé les lettres en anglais et en japonais, maintenant, il devrait être possible d'insérer des trémas "ü, ö, ä, ß"
Hallo, ich bin der Deutsche Übersetzer des Spiels Star Ocean. In unserer comunity hat ein Mitglied "blackerking" die Tilts zu den Buchstaben gefunden im englischem und im japanischem, nun sollte es möglich sein umlaute einzufügen "ü,ö,ä,ß"